A group of folk-rockers with hearts deep-rooted in their Rust Belt home will be teaming up with the world's premier undead funk ambassadors to bring one heckuva show – for free – to Erie's beautiful Bayfront. Sound like some kinda great Tuesday? 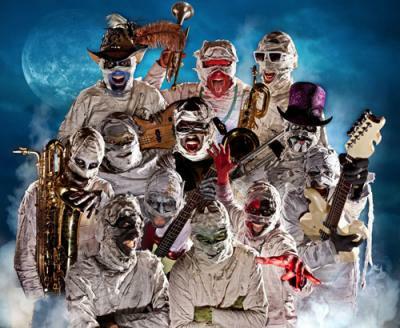 It's sure to be – one of 8 Great Tuesdays, that is – when Erie's own Falling Hollywood and Nashville's Here Come the Mummies (who describe themselves as "terrifying funk from beyond the grave") take the stage at Burger King Amphitheater July 29 for the next installment in the ever-popular summer music series. And your very own Erie Reader (that's us) is serving as one of the evening's event sponsors, so you know we'll be there, for all the folk, all the funk, and all the fun. Stop by the Reader's tent, too, if you wanna share any thoughts, just hang out, or find out everything you've always wanted to know about the region's premier free, independent news publication (that's us). So, in a nutshell, there it is: Falling Hollywood. Funky mummies. And us, your friendly Reader staff and contributors, all in one place, on one night. That's a great Tuesday, alright.